Originally published on January 31, 2019 in The Western Producer. BRANDON — David Lobb is not giving up. For more than a decade, the University of Manitoba soil scientist has argued that soil erosion remains a massive problem in Canada, especially in hilly landscapes like the prairie pothole region. Farmers may assume zero tillage or conservation tillage have fixed the problem, but that’s not the case. Lobb believes 10 percent of Canada’s cropland has moderately to severely eroded soil. The poorer yields on 10 percent of the land base is costing Canadian farmers about $3.1 billion each year in lost productivity. “The areas where soil erosion has been most severe, like the hilltops … you have almost no capacity to grow crops, or plants of any type,” said Lobb, who spoke late January at Manitoba Ag Days in Brandon. During his speech, Lobb compared the economic impact of soil erosion in 1971 to 2011. In 1971, about 37 percent of soil in Canada was highly eroded and causing yield losses of about 17 percent. The economic cost of reduced yields was about $1 billion annually, in 2016 dollars. Thanks to zero tillage and conservation tillage, by 2011 only 10 percent of cropland was highly eroded. However, yield losses on those areas, mostly hilltops and slopes, had grown to 60 percent. As well, yields of high value crops such as canola and soybeans are much higher now than they were in 1971, so the economic cost of the lost productivity is $3.1 billion, triple the cost from 1971. “Even though we have all that conservation tillage, the actual loss has gone up, it hasn’t gone down,” Lobb said. Lobb’s data and estimates are based on his own economic analysis. Lobb is now working with University of Guelph soil scientists to update the numbers. They hope to publish a paper based on the research. Lobb made the point several times in Brandon that conservation tillage has been a tremendous success story in Canada. However, decades of tilling have severely eroded the soil, removing topsoil from the knolls and slopes of hills. “In some areas of Manitoba we find topsoils at the bottom of hills 50 to 100 centimetres thick,” he said. Zero tillage isn’t going to fix that issue. If farmers want to restore the eroded soils, they need to do more than conservation tillage, Lobb said. One option is adding cover crops and perennial forages to the rotation to build up organic matter in the soil. A more impactful solution is dragging soil from the bottom to the top of the hill. Since the 2000s, Lobb has conducted field trials on moving topsoil to the tops of knolls at multiple sites in the northern Plains. The results were dramatic. “It’s easy to get a yield increase of 40 to 140 percent because you’re starting at almost zero yield,” Lobb said. After harping on the same message for more than a decade, a few farmers may be listening to Lobb. 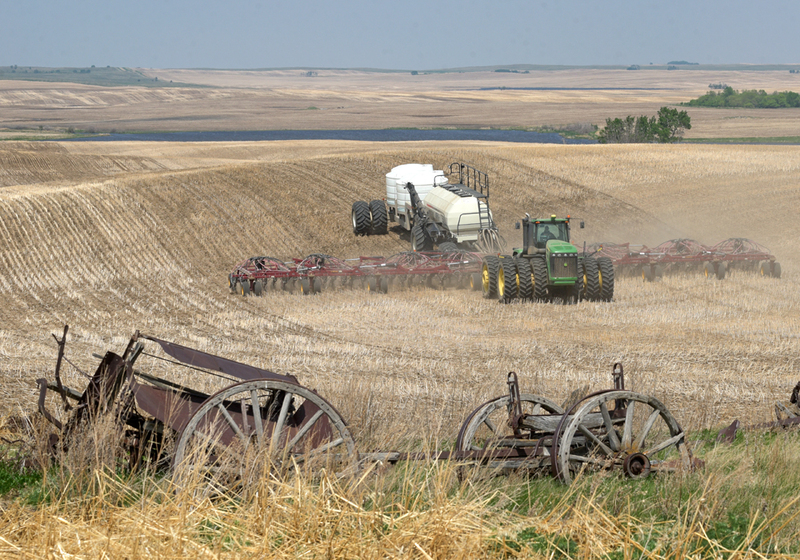 He estimated dozens of producers in Western Canada have dragged soil to the tops of knolls, and the practice is catching on south of the border. “In Europe, there are farmers that have been doing this for decades,” he said. Daryl Ritchison, a meteorologist in North Dakota, spoke just before Lobb at Ag Days. He shared stories from the Dirty Thirties and showed photos depicting the devastation of soil erosion. Ritchison also shared recent photos of snow-covered cropland that was black, not white, because the snow was littered with soil.